There is nothing better than an attractive, not to mention useful, and above all unusual product that conveys a brand’s core values to support promotional activities. After all, this is the most important asset of any international drinks company. 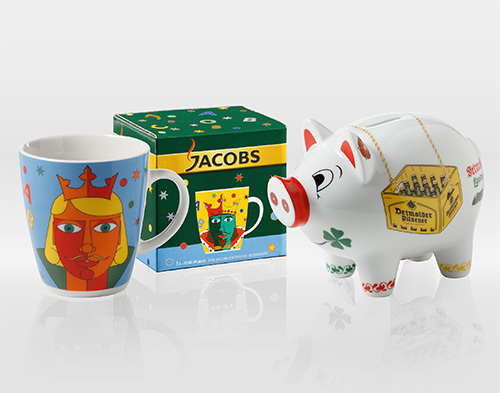 The fact that RITZENHOFF products have won numerous prizes and are seen as a symbol of excellent design in over 60 countries around the world is what turns our glasses, porcelain products and accessories into perfect gifts – with appropriate packaging, which we are happy to develop with you, perfectly completing the promotional set. Thanks to our decades of tried and tested brand expertise, we have helped to develop numerous promotional items and have conducted multiple successful marketing campaigns, taking care of them every step of the way. In addition to the creativity of over 300 designers and artists who work for RITZENHOFF on a freelance basis, our logistical expertise is always a reason why many marketing departments choose to put their faith in us. We not only have space for ideas, but our new logistics centre means that we also have the necessary resources available to handle the professional management of promotion campaigns. In this way, we can help our clients to strengthen trust in their brand, improve customer affinity and ultimately increase their sales figures. For greater success together.